Just last week, Google trotted out Android Wear, its first big push to extend the dominant smartphone OS to wearable devices. The first Android Wear device, an LG smartwatch, was also announced and more are sure to come. They'll add to scores of wearables that have been unveiled this year, starting at International CES in January. The devices purport to improve lives -- even to help save them -- but not everyone is rushing to buy them. In this untested market, the many unanswered questions include concerns about user privacy and what form-factors will be comfortable and attractive enough for long-term use. It's easy to see what vendors are getting excited about. If wearables take off the way some predict they will, their market potential is huge, and the space is still wide open, with no dominant player. The wearables business is expected to be worth more than US$1.5 billion in 2014, almost double its value in 2013, according to an October report by Juniper Research. The U.K. market research company said 2014 will be "the watershed year" for wearables. Vendors' rush to corner the market was perhaps best explained by Kaz Hirai, CEO of Sony, while speaking at CES. "You have only two wrists and one head; you can't wear 10 different products," he said. "Once you secure someone's wrist with a particular product, they'll usually stick with it." At CES, Sony introduced "Core," a fitness and activity tracker that links to an Android app to provide users a snapshot of their day: steps taken, distance traveled, GPS maps of the route they took, and even the songs they listened to. The current boom in wearables can be traced back to around 2006 when Nike gave the pedometer a digital twist. Its small Plus device slipped into a running shoe and counted the steps taken and time elapsed on a run. The information was sent to an iPod application and to an online community where people could track and compare their workouts. Other companies followed, and in late 2008 Fitbit attracted considerable attention with its namesake fitness tracker. It captured the imagination of many because it was small, could be worn easily and silently collected data all day long -- no matter what shoes you were wearing. What's more, it didn't require a constant connection to a smartphone. It could be worn at work, at home or at the gym and uploaded the data once in range of a docking station. The device matched well with the constant connectivity of the smartphone era that was just beginning. Fitbit followed up with additional products. 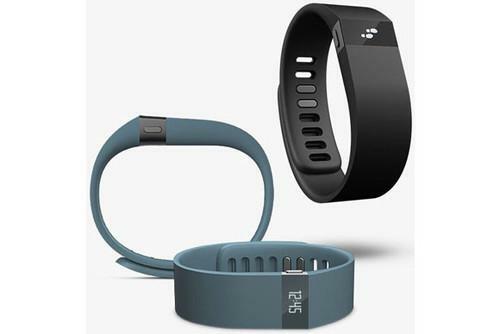 Its latest, the $130 Fitbit Force, is a wristband-type device with a small digital display. It's still based on the concept of step-counting, but the app extrapolates additional data including distance traveled, minutes of activity and calories burned. An altimeter estimates the number of steps climbed. If users keep it on while they sleep, it will even attempt to measure sleep quality. Jawbone, a San Francisco-based speaker and headphone maker, sells the Up 24, a $150 wristband "lifestyle tracker" that works with an iPhone app. An accelerometer measures activity based on the number of steps taken each day. Another popular tracker, the $199 wristwatch-style Basis B1, packs several sensors on the back that keep contact with the skin. These add blood-flow, heart rate and perspiration to the usual measurements taken. Nike has improved its device and currently sells the Fuelband SE. The $150 wristband tracks an entire day of activity and measures performance against user-defined goals. It's set up through a companion iPhone app. Not to be left out, Adidas is rivaling Nike with the Smart Run, which is also worn like a wristwatch. It has a color display, versus the monochrome B1, and provides information on workouts, including distance traveled and lap times. An accelerometer measures stride, and the device can link via Bluetooth to an optional heart-rate monitor. It will even play your workout music. As innocuous as fitness trackers may appear, not everyone is comfortable having their every move, and sleep-wake cycles, uploaded to become yet another form of very personal "big data" stored and potentially used in as yet unforeseen ways by third parties. In late 2012, news reports surfaced that Apple was developing a smartwatch with Intel. Apple hasn't confirmed that the project even exists, but its success in redefining the portable music and smartphone markets means a lot of attention is focused on the Cupertino company. The speculation was fueled in mid-2013 when news leaked that Apple had hired Jay Blahnik , developer of Nike's Fuelband, to work on its wearables team. "I think the wrist is interesting," Apple CEO Tim Cook told the All Things D conference last May. "But as I said before, for something to work here you first have to convince people it's so incredible that they want to wear it." That's what a handful of companies are already trying to do with so-called "smart watches" that connect to Android phones. Sony's Smartwatch 2 runs dedicated apps that bring Gmail, Twitter and Facebook to the wrist. The device has won praise for good looks, but a constant criticism has been the resolution of the 1.6-inch LCD screen. At 220 by 176 pixels, graphics and text sometimes appear a little jagged. And notifications aren't synched: If a message is read on the watch, it remains unread on the phone. Clearly, the technology is still at an early stage. Pebble, a startup, raised several million dollars through a Kickstarter campaign to fund development of its first watch. The $249 gadget combines the functions of a fitness tracker with a music player and app notifications. The screen is lower resolution then Sony's device, at 144 by 168 pixels, and based on e-paper technology, which means longer battery life but limits the display to monochrome. It has the advantage of working with Android as well as iOS phones. Samsung jumped into the market with its Galaxy Gear range of products. Originally just a smartwatch -- that received a muted response from reviewers -- the range now consists of two smartwatches and a fitness band. "There's no question that Samsung, with the Galaxy Gear, wanted to get in there before Apple," said Carolina Milanesi, a director at Kantor World Panel. Some companies are holding back, she thinks, waiting to see what Apple comes out with rather than competing pro-actively. "Whatever Apple is going to do, it will change the market," she said. Apple's product, whatever it may be and whenever it's unveiled, could do a lot to shape the short-term future of the wearables market. But there's another powerful company with a high-profile product that's also turning heads ... and testing laws. Google Glass has garnered significant attention, good and bad. The head-mounted display projects information onto a small prism above the user's right eye and has attracted controversy for its ability to record what the wearer is seeing. Privacy advocates charge that this function essentially turns Glass-wearers into mobile surveillance stations. Wearers, called "explorers" by Google and, more derisively, "glassholes" by some others, can read email, get directions and search the Internet. Google is keen to promote real-life applications, like surgeons using Glass in the operating theater, cyclists getting real-time directions and firefighters using it to see floor plans of buildings as they enter, but Glass appears to be little more than a gimmick for now. At $1,500, it's also well out of the range of the average consumer, though the price will come down over time. Perhaps Google's biggest contribution won't turn out to be Glass but Android Wear, a new version of its Android OS for smartwatches and other wearables. Google is working with companies including Fossil, Asus, LG, HTC, Samsung, Intel, Motorola, Mediatek and Qualcomm on smartwatches. The first product will be here in the summer: Motorola's Moto 360 packages notifications and Google Now features into a fairly stylish device that looks a lot more like a watch than a gadget. Motorola hasn't shared any specific details on timing, pricing or specifications. One thing's for sure: fitness trackers, smartwatches and glasses won't be where wearables stop. Thalmic Labs has developed an electromyographic sensor called Myo that's worn on the arm and picks up electrical muscle activity to interpret movements and gestures. A demonstration of the $149 device shows how a user playing a video game can simulate drawing a gun and firing it. Another clip shows a person steering a drone by twisting his arm back and forth. "The relationship between people and devices is getting closer," said Stephen Lake, CEO of the Ontario company. "People are willing to wear different technology." While an armband might not be a stretch, how about a wig? Sony's Smartwig, revealed in a patent application, connects to a smartphone and might include a GPS, camera, ultrasound transducer and even a laser pointer. With enough sensors, the wig could read facial expressions by tracking the movement of skin, or figure out where a person is and what direction they're looking in. It might provide a discreet vibration when a message is received. To be sure, the Smartwig isn't much more than a patent application right now. Sony has a few prototypes, but there's been no talk of a product. A new communications protocol called Bluetooth Low Energy, which is just making its way into phones, is helping to push the industry forward. "It enables devices to more easily and quickly connect and disconnect from other devices," said Thalmic's Lake. "It's really good when you're sending little packets of data. Traditionally it was a full-time connection, but Bluetooth LE sleeps and wakes and sends bits of data to bring dramatically longer battery life." Wearables haven't escaped the attention of Intel, the world's largest chip maker. At CES, Intel unveiled several prototypes based on a computer called "Edison." No bigger than an SD Card, Edison is a "full Pentium class PC" running Linux with built-in Wi-Fi and Bluetooth. Intel showed a baby's "onesie" made by Boston-based Rest Devices, fitted with sensors that monitor the infant's temperature, pulse and breathing. By clipping an Edison-equipped toy turtle onto the onesie, the baby's vitals are broadcast to the parents. But instead of being sent to a smartphone, Intel showed coffee mugs that flash different colors depending on what the baby required. Intel also showed a pair of ear buds with a built-in sensor that lets them act as a heart monitor as well as play music. And it showed a prototype smartwatch that works with a geo-fencing system to let parents know when their children stray off the route on their way to school. If you think that sounds far-fetched, you should see what's being cooked up in research labs. Google recently showed off a prototype contact lens that has an embedded sensor to measure glucose levels in tears. The idea is that diabetics can be alerted on their phone (or perhaps Google Glass) when their glucose level gets low. The lens is in the early stages of development. Intel, Honda, Toyota and various university labs are developing scanners that attempt to detect thought patterns. The technology, called BMI (brain machine interface), uses electroencephalography (EEG) to ostensibly translate thoughts into intentions. Toyota showed a scanner in 2009 that allowed a person to steer a wheelchair through thought alone. With around 15 hours of training, the system could be tuned to a user's motor-control thought patterns to be 95 percent accurate so that basic left, right, forward and stop commands could be understood. Fellow Japanese automaker Honda developed a prototype system that uses EEG and near-infrared spectroscopy (NIRS), a technology that measures blood flow, to control a robot. In a Honda video, a researcher is shown a gesture printed on one of several cards -- moving the right hand, left hand, foot or tongue -- and then asked to visualize making the action. A robot then performs the action. Honda says it can get a success rate of up to 90 percent. Intel recently demonstrated a system using NIRS that tries to figure out when car drivers are concentrating on the road ahead or daydreaming. Intel says information from the system could theoretically be used to adjust the car's environmental controls to keep a driver awake or give more or less control to safety features such as automatic braking or lane control. While the potential uses for wearables are vast and getting more interesting, getting the majority of people to strap a computer on their body could be a tough order, especially in the wake of revelations about how much users are already tracked when they are online. In the end, what's still missing is that first killer app that causes consumers to forget their concerns about privacy in order to be part of the next big thing. "There's a lot of potential in this space, [but] the jury is still out on which applications will really compel consumers to go out and wear these products," said Sony CEO Hirai.